Midterms are only days away! What are you doing to prepare? Are you planning on spacing out your studying? Getting a friend to quiz you? Using your study guides or flash cards? Cramming an hour before your test? Here at Indian Creek, we learn that everyone learns differently, but there are some things about the human brain that NEVER change. Dr. John Medina’s book, Brain Rules, can offer some great advice to make your brain work for you during the stressful midterm season. The weather outside might be frightful, but don’t let that slow you down! While you’re studying for midterms, remember to take some time to exercise your body, as well as your mind. Take a break to do some jumping jacks, run in place, or jog around the school! The increased flow of oxygen to your brain will increase your brain power! The human brain is a learning machine! If you start to feel hopeless in the midst of your midterm studies, just remember that your brain has evolved over millions of years to do extraordinary things! Indian Creek is a great place to learn about how you learn – this is called meta-cognition. If you know that you learn better when there is music playing, make a study-time playlist and get to work! If you need absolute silence, borrow some noise-canceling headphones from the library! Don’t be discouraged if it seems like your peers are catching on faster than you; every brain is wired differently. Practice study habits that you know are successful for your brain! Shut off the TV in the background. Shut off your phone. The constant beeps and boops of notifications coming in will make it really hard to keep your attention focused on your studying. Take breaks every 10 minutes or so. Get a drink, do some jumping jacks, stand on your head! Just DON’T. CHECK. YOUR. PHONE! Think about how the things you’re studying apply to you. You’re more likely to pay attention if the facts feel relevant to your life. Talk to your teachers if you’re having trouble making these connections. Repetition is the key to remembering facts. You lose most of what you learn 30 seconds after your brain receives the information! To remember the information you’ll need for your midterms, make sure to revisit your study guides more than once. The more times you repeat the information, the more likely you are to remember on test day! This might sound easy, but the trick to studying with repetition is to space out the times that you repeat information to yourself. Repeating something three times fast, for example, won’t do you much good on your test. Instead, try completing 10 minutes-worth of one study guide, take a break and study something new, and then revisit the first study guide again, repeating the information for a second time. Then, repeat again! Keeping Brain Rule #4 in mind, we’ll keep our post short. In the next installment, we’ll look at the next 6 Brain Rules and how you can use them to your benefit during testing season. Keep your eyes peeled for the second part of this series on rocking the midterms with Brain Rules! 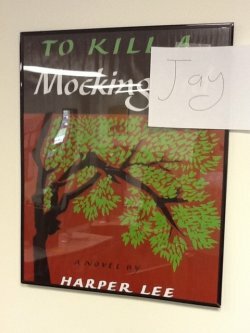 An anonymous artist modified a framed poster of a To Kill a Mockingbird book cover in the computer lab. It now says “To Kill a Mockingjay.” Have you read the Hunger Games series? Someone is letting their fan flag fly! Originally posted on April 3, 2012 on http://www.indiancreekschool.org.